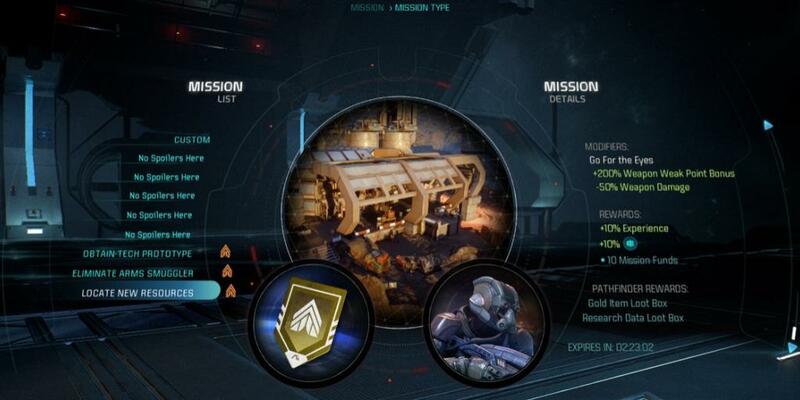 Mass Effect Andromeda: EA Access Details | Nerd Much? EA/Origin Access for Mass Effect: Andromeda will begin March 16 and the details are finally coming out, via Twitter of course. According to lead designer Ian S. Frazier and producer Fernando Melo, you’ll have 10 hours full access to the multiplayer and a limited amount of a single player story campaign. It’s just like christmas, according to Melo, “on the 5th day of MP-mas, the MP dev team gave to you: a new feature in MEA – Missions. Your link between MP/SP. Play & get rewards in both.” For the single player, Melo stated that “you can play it all in sp if you want, but it is gated (you can’t cont story after a point, but can explore or restart for ex)” presumably meaning that you can restart and explore the story’s area as much as you like before meeting the end. These rewards will include “Pathfinder Rewards” (that’s Mass Effect for loot boxes), both Gold Item Loot Box and Research Data Loot Box. These will be random rewards and Melo assures players that there will be no microtransactions in single player. Thank the Gaming Gods for that small wonder. Are you going to playing in EA’s early access? Looking forward to all the sweet rewards? Let us know in the comments below!